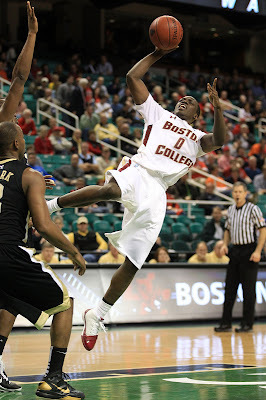 BOSTON COLLEGE 81, WAKE FOREST 67 – Reggie Jackson was one of three Boston College players with at least 20 points in the Eagles’ victory against Wake Forest on Thursday in the first round of the ACC tournament. Jackson scored 27, Joe Trapani added 22 points and Biko Paris had 21 for the fifth-seeded Eagles (20-11). They shot nearly 54 percent on 29-of-54 shooting, made 10 3-pointers and used a huge first-half run to boost their NCAA tournament chances and blow out Wake Forest for the second time this week. The Eagles will face fourth-seeded Clemson on Friday in a quarterfinal matchup of NCAA bubble teams. Travis McKie had 16 points and 12 rebounds for the 12th-seeded Demon Deacons (8-24), who haven’t won an ACC tournament game since 2007. They never led and capped the losingest season in school history with their 11th straight defeat.